Students at the London College of Fashion are exploring emerging technologies and their impact on the fashion industry. Microsoft and a UK-based institution have teamed up to launch a "future of fashion" incubator, a short-term intensive program where students work together on multi-disciplinary projects. The London College of Fashion, a constituent college of the University of Arts London, co-created curriculum with Microsoft for the semester-long program, which brings together students from the Fashion Business School, the School of Design & Technology and the School of Media & Communication. 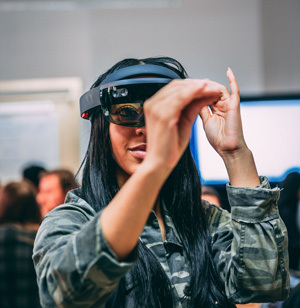 Participants have attended workshops and explored various Microsoft technologies and their impact on the fashion industry — including mixed reality and 3D, the Internet of Things and artificial intelligence — before choosing a study focus. Once the concepts were established, each team consulted with an "incubator ambassador," a professional in the business who guided team members in turning their ideas into prototypes. Those are being unveiled during an exhibition taking place this week online and in person. Janet, a personalized stylist app that uses artificial intelligence to suggest outfits based on what the wearer has recently bought and what's trending on social media. The app can also be used during physical shopping experiences to guide buyers on what will work with their existing wardrobe. "Collaborating with Microsoft to empower our students with emerging technologies across courses through this project is incredibly exciting," said Matthew Drinkwater, head of the Fashion Innovation Agency within the college, in a press release. "Fusing business ideas with mixed reality, artificial intelligence and machine learning, ultimately, will allow a pathway to creating the digital designer business of the future."